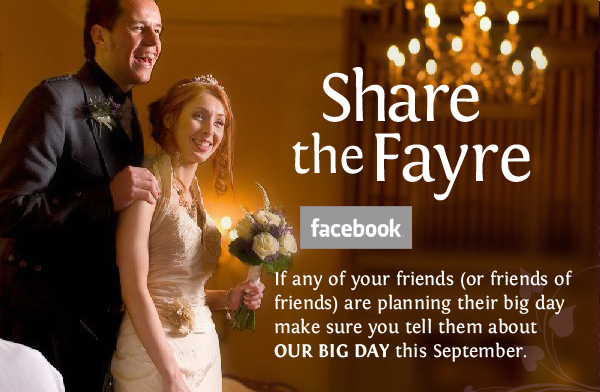 you for your big day. 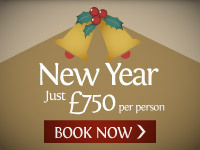 TERMS: Based on double occupancy at party nights throughout December 2013. Groups of less than 8 may have to share a table with others (maximum 12 per table). Subject to availability, full terms upon request. bridges, tightropes and tonnes of tricky obstacles. Aloft! 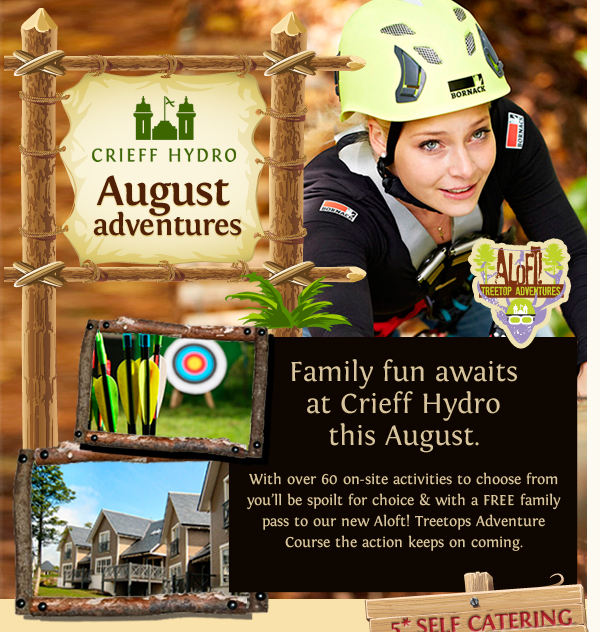 is made up of three tree top adventure challenges ranging from 2.5 to 14 metres up in the air - Opening this Autumn so come along and try out one of the biggest challenges we can muster up. 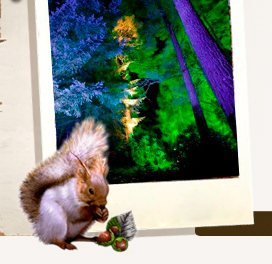 Crieff Hydro and The Enchanted Forest in Pitlochry. 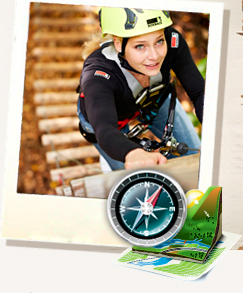 Adventure pass here at Crieff Hydro. 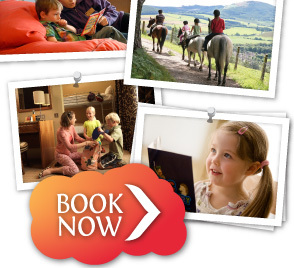 Offer based on 2 adults sharing standard family accommodation on midweek dates until 7 October 2013. Subject to availability, full terms on request. from 24 or 30 December 2013. *Additional activities available at great rates. Subject to availability, full terms on request. TERMS: Based on two adults sharing standard twin, double or family accommodation, for two nights from 11 to 31 October 2013. Subject to availability, full terms on request. four on woodland combat, air rifles and archery. Pre booking required. Subject to availability, full terms on request. Terms: Based on two adults sharing standard accommodation (Sunday - Thursday) from 18 - 28 August 2013. Subject to -availability, full terms on request. 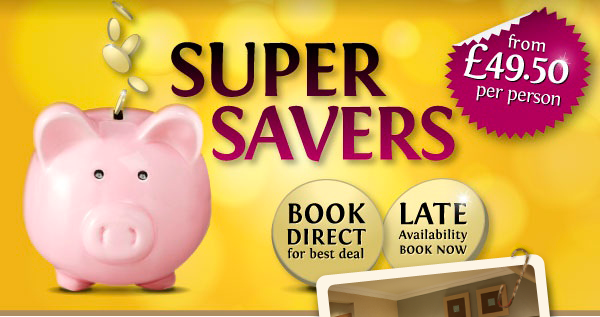 Terms: Offers based on 6 people sharing a two bedroom self catering unit. No discount given for under occupancy. 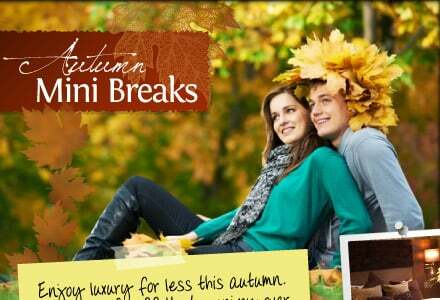 Based on four night midweek breaks in September 2013. Subject to availability, full terms on request. 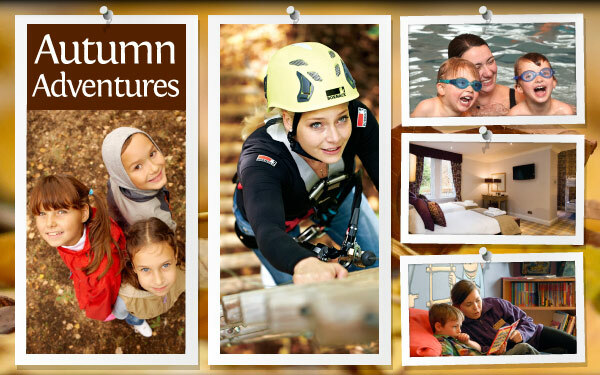 Terms: Offer based on two adults sharing standard family accommodation from 24th August 2013, for two nights. Subject to availability. Full terms on request. 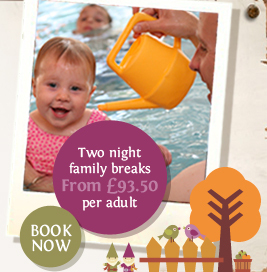 Terms: Offer based on two adults sharing standard family accommodation from 3rd August 2013, for two nights. 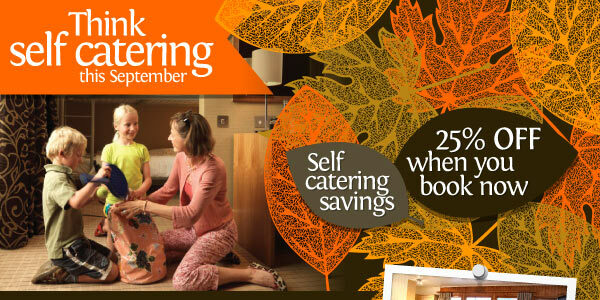 Summer self catering breaksWhat’s included? Terms: Based on six people sharing a two bedroom self catering unit midweek during July and August 2013. No discount given for under occupancy. Minimum stay applies. *additional price applies. Subject to availability, full terms on request. Terms: Offer based on two adults sharing standard or double accommodation from 1 July – 31 August 2013. Minimum stay applies. Subject to availability, full terms on request. (Sunday to Thursday) from 18 July to 31 August 2013. Subject to availability, full terms on request. *Additional charges apply for activities. And yes, under 2s really do stay free! 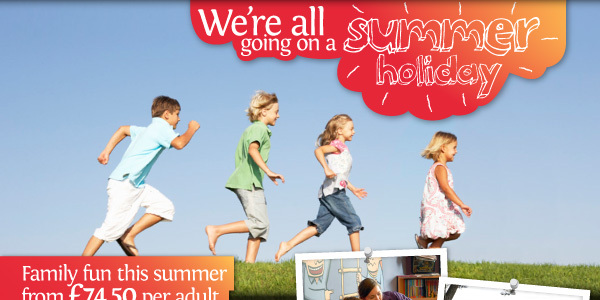 Terms: Based on two adults sharing standard double accommodation from Sunday – Tuesday throughout July 2013. Minimum three night stay applies. Subject to availability, full terms on request. We don't need to tell you that Skye is home to some of the best shellfish in the world. What might surprise you is that we can get the catch from David's boat on a Wednesday evening, and onto your plate the following day – every Thursday in July. Specialities will include double-dived scallops and Loch Eishort mussels. All served in our adults-only area of the Meikle Restaurant. Darjeeling is lovely. But not quite as delightful as Hendrick's, poured from its very own ginpot. (Dainty little cups and saucers complete the scene). We've not forgotten all the other accoutrements of afternoon tea in the Winter Gardens, such as precision-cut sandwiches and the cream of all cake stands. Other ice cream sundaes cower in their presence: Bruce wasn't kidding when he set out to create the ultimate in summer flavours. Think mini marshmallows, crushed cookies and lashings of toffee or chocolate sauce. When Bruce set about creating his strawberry and elderflower jelly desert for the Brasserie he knew that the key was in the fruit. That's why we make sure we get all our berries from nearby Arbuckle Farm – they're delicious! Look forward to the best thing since (and between) sliced bread with our new summer sandwich fillings in the Winter Garden and Hub. There's brie with avocado and cranberry chutney or pastrami and gherkin with mustard mayonnaise and leaf spinach. There are many others to choose from – all made freshly each morning by Bruce and his team. Head to the Glen this summer for an action packed day of adventures. There's over 30 activities to choose from including Segway Trekking, Crazy Golf, Vertigo Ropes and Quad Bike Quest - all with stunning views across the Strathearn valley. There is also five places to eat and chill out between adventures. 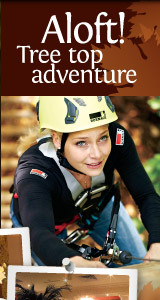 To win an adventure at Action Glen just visit facebook.com/ActionGlen and become a fan. 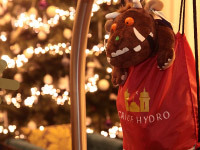 Avoid the midweek blues and indulge in some much needed girls time at Crieff Hydro this summer. Treat your friends, sister or mum to a relaxing getaway where you can enjoy luxury accommodation, a rejuvenating facial treatment and a two course lunch in our Brasserie Restaurant. Sit back in the Winter Garden and take a sip on a refreshing Hendricks G&T served in a vintage teapot alongside a delicious selection of sandwiches and cakes. Pitchers of Pimms on the terrace available throughout this summer, perfect after a game of tennis or whilst watching Wimbledon on the big screen. Why not explore all that Perthshire has to offer this summer when boarding the Ring of Bredalbane Explorer. Hop on and hop off at some great Perthshire attractions including the Famous Grouse Experience, Lochearnhead, Scottish Crannog Centre and Ben Lawers. A great deal more, for a great deal less! A brilliant base for your adventures. 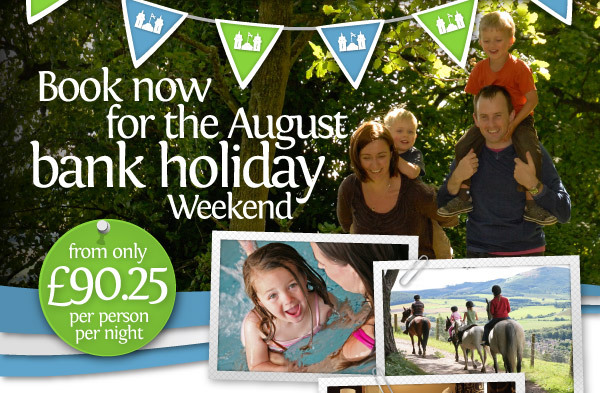 Our three-star woodland chalets are brilliant value for families. 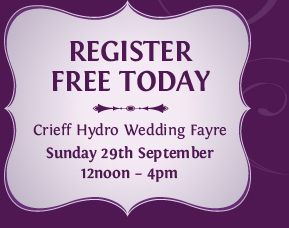 They give you the freedom of self-catering - but with all the Crieff Hydro facilities on your doorstep. That means over 60 outdoor and indoor activities, five restaurants, swimming pool and gym and an 18-hole golf course. It's all yours to explore and enjoy. Our chalets have two bedrooms, but can sleep up to six people thanks to the sofa bed. Cooker, fridge, outdoor dining space - there's everything you need for a comfortable family break in the countryside. 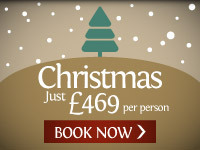 Terms: Based on 5 people sharing a 3* chalet, for four nights, from 24th June 2013. No discount given for under occupancy. Subject to availability, full terms on request. 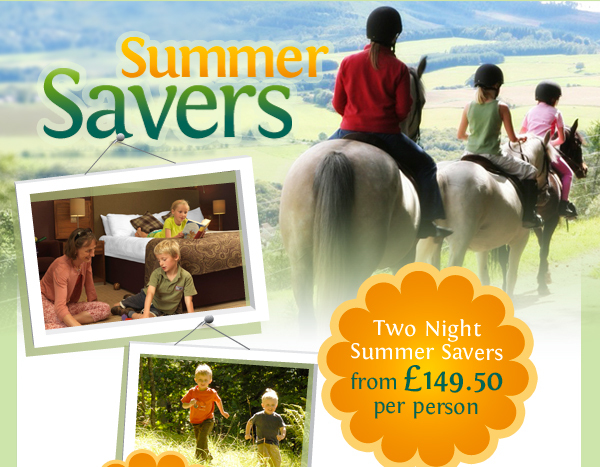 I wanted to get in touch to let you know of some great savings available on self catering breaks at Crieff Hydro this June. 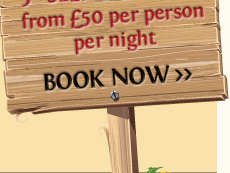 Arrive on 14th June for three nights from as little as £33.40 per person, per night and enjoy a host of great extras. Terms: 5* self catering offer based on 6 people sharing a two bedroom cottage for three nights from 14 June 2013. No discount given for under occupancy. Minimum length of stay applies. Subject to availability, full terms on request. 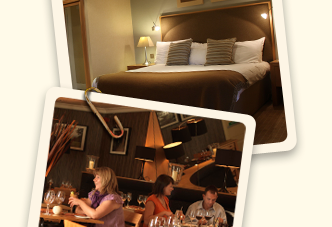 Terms: Based on two adults sharing standard double accommodation from Sunday – Tuesday throughout June 2013. 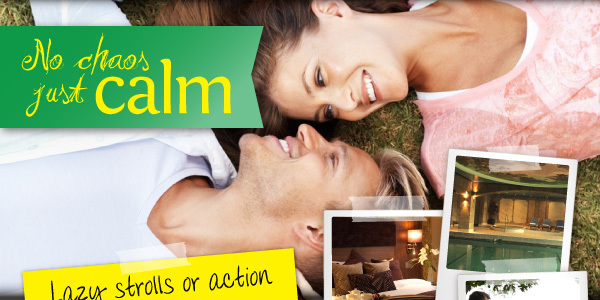 Terms: Offer based on two adults sharing standard double accommodation on 1, 8 or 29 June 2013. 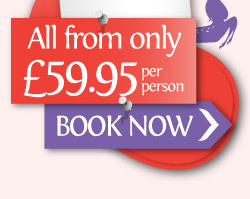 Arrive on 26th May for four nights from as little as £27.75 per person, per night and enjoy a host of great extras. 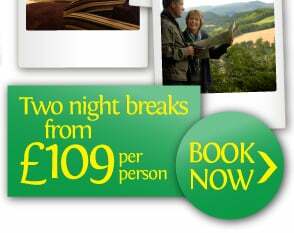 Arrive 31st May for two nights from only £20 per person, per night. A brilliant base for your adventures. 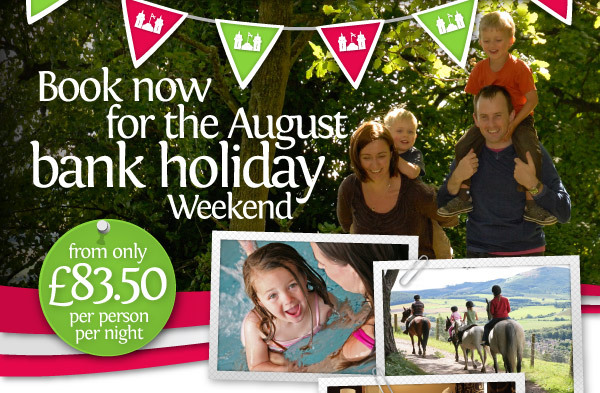 Our three-star woodland chalets are brilliant value for families. 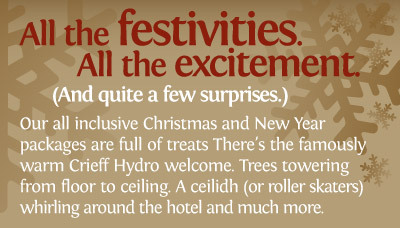 They give you the freedom of self-catering - but with all the Crieff Hydro facilities on your doorstep. That means over 60 outdoor and indoor activities, five restaurants, swimming pool and gym and an 18-hole golf course. It's all yours to explore and enjoy. Our chalets have two bedrooms, but can sleep up to six people thanks to the sofa bed. Cooker, fridge, outdoor dining space - there's everything you need for a comfortable family break in the countryside. Terms: 5* self catering offer based on 6 people sharing a two bedroom cottage for four nights from 26 May 2013. 3* chalet offer based on 5 people sharing a two bedroom chalet for two nights from 31 May 2013. No discount given for under occupancy. Minimum length of stay applies. Subject to availability, full terms on request.